MotoLady Seven Days of Give-aways is here! A big thanks to her readers, MotoLady is giving away stuff! Better check in, else miss a sweet chance for some motorcycle gear and goodies! 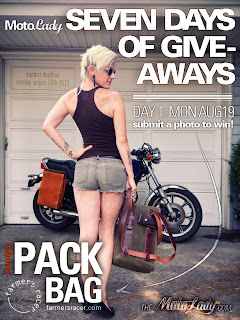 Day 1, Monday: Win this amazing Farmer’s Racer pack bag in orange 18oz wax canvas. Having an almost nine gallon capacity makes it perfect for motorcycle camping, river trips, tool kits, almost anything really. The benefits of it being hand made in Sweden are very apparent in it’s construction. Send a creative photo of what you carry every day when you ride. It might be your rain gear, emergency tool kit, spare socks or underwear… whatever! But the prettiest layout and coolest photo wins, so put some effort into it. To enter use the handy submit page. Submission deadline: Monday, August 26th, 2013 11:59pst. Announcing winner: Monday, September 2nd, 2013. Winner is responsible for shipping costs.